How well is your IT Support Organization doing? The real answer lies “in the eyes of the beholder” as they say. What this means here is that your client’s perspective is what’s important, , , not what you and your IT staff think. I’m not trying to stir up trouble but I do want to make a point. Some of this may be true but the bottom line is that when you focus IT support, your client’s perspective is what’s really important. Do you know what your client would say when asked about their IT support? At a minimum, you need to evaluate and understand these issues on a somewhat regular basis. To do this, you can use a simple IT Support – Client Satisfaction Survey. There are only 5 questions and requires only a few minutes to complete. CLICK HERE to download the survey tool. Rather than sending a survey out and hoping your clients will fill them out and return to you, , , visit or call your client to conduct your survey and fill out the form yourself. You will get a much higher response, , , no one likes to fill out surveys. If the response is negative, you can ask a follow-up question or ask for an example to better understand your client’s perspective. You will learn much more than if they simply fill out the survey. Visiting your client and communicating with them one-on-one is always a good thing for you to do. If you conduct a client survey, be sure to follow-up with results of the survey and actions to be taken to improve IT support. Otherwise, “Why do one?” It helps you gain credibility when you follow-up with specific action items. Another thing to consider is to conduct your surveys twice a year, , , at least annually, and use the same questions each time. Doing this will help you monitor trends and see if you are making progress in providing support for your clients. Have you ever tried to get an infrastructure project funded only to discover that it is like “pulling teeth” to get your senior manager’s approval? If so, it is probably because your senior manager is having major difficulty understanding what you are talking about. All he hears is that you are asking for lots of money, , , and that’s not something he lets go of without understanding the value of what he will receive from the investment. 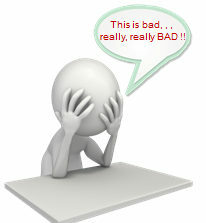 Senior executives normally do not understand technology, , , and they don’t want to. Well, if that’s the case, , , how do you get a technology project funded that’s critical for the stability and support of your infrastructure? You know how important it is but you aren’t getting the message across to your boss, the CEO. Something that will help is to discuss the project in terms of business value, , , and certainly not in technical terms. Discuss “WHY”, , , not “WHAT”! “WHY” deals with benefits, , , i.e., business value. “WHAT” deals with technology. Unfortunately as former technical people, IT managers tend to discuss the “What” and not the “WHY”. It’s a guaranteed way to put your CEO to sleep or give him a major headache. When you change your presentation to highlight the business value your company will receive by making the infrastructure investment, your senior manager hears and understands you, , , and when this happens, he makes a decision that usually goes your way if there is sufficient value for the investment. A tool that can help significantly is to paint a picture of the ‘cost of downtime’ that your project recommendation will help eliminate. Corporate HQ Office is home of the Data Center where there are three servers. We estimate the average salary of a company employee is $20/hour. The green filled circles are routers. If the Atlanta office router goes down or they lose connectivity, the productivity loss at 100% is $2,000/hour. If the HQ router goes down (green filled circle on the Corporate HQ box), all remote offices lose connectivity and 100% productivity impact will be $20,000/hour. If the E-mail server crashes it affects productivity of all 1,500 workers. At 10% productivity factor, the impact is $3,000/hour. 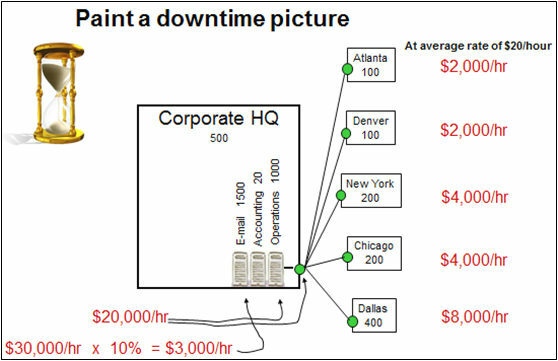 Using these assumptions you can quantify the ‘cost of downtime’ for any component in your company, , , even a zone printer or a single PC. Once you and your client can visualize the downtime scenario we created above, you can list key components in a downtime chart and refer to it when trying to justify an infrastructure project. 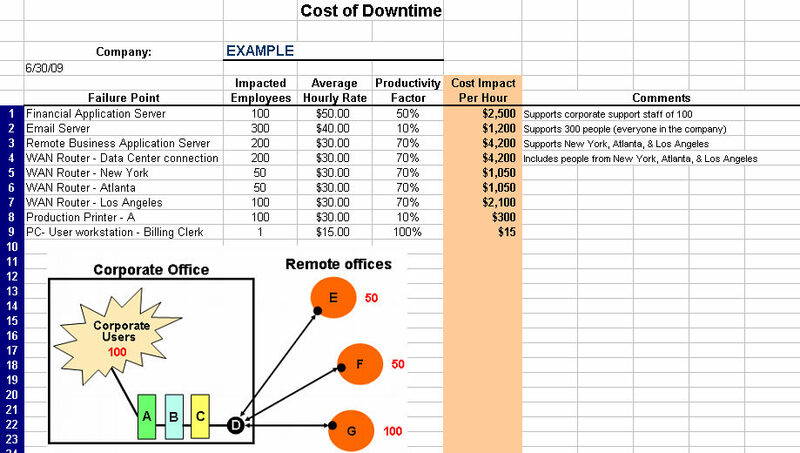 CLICK HERE to download the Cost of Downtime tool. Downtime has huge cost and productivity implications for your company. If you need to implement a redundant router at the HQ building to reduce the risk of having a single router point of failure for 1,000 of your remote office workers, it is pretty straightforward and easy to get funded when the CEO sees the potential productivity cost risk of downtime with a single router. From time to time your IT organization will probably experience a client who is unhappy, , , maybe even one who becomes a “problem client”. 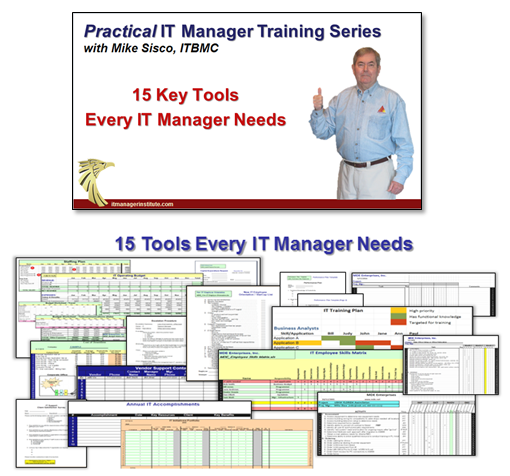 For the most part, your IT organization’s “client” includes the non-IT department managers of your company and their employees. We often call them “Users”. However, don’t forget the executives of your company. They and their Administrative Assistants are also part of your client base. You may also have external clients. For example, if you develop and license software, you support the external clients who license the software. A negative client is bad for your IT organization. What is it they say, “An unhappy client tells 20 other people about their problem.”? That’s right, bad news spreads like wildfire so it is important to address and resolve an unhappy client situation. The great news is that when you turn an unhappy client around, they can be allies forever. Unhappy clients are actually opportunities for you and your IT organization. Most clients do not want to be unhappy with their IT support team. Identify the issue and take appropriate action and you are on your way to creating a strong partner. Step 1 – Define the problem. To improve a bad client situation, you must know what the problem is. Your employees may not have a clue as to what the real problems are so you have to interview the client to get to the problem. Step 2 – Quantify the issues. In quantifying the problem, you must quantify and articulate the specific issues that come from the client’s discussion. You won’t be able to solve the problem unless you are very specific as to the issues that are causing the problem. After listening to the client, list the issues specifically that must be addressed to resolve the situation. Step 3 – Gain client agreement on the issues and commitment to what will occur when the issues are addressed. Once you have listed the issues that must be addressed, gain concurrence from the client until you know you have listed every specific issue to be addressed. When you positively address the issues causing the problem, identify what the client should be committed to do. This might mean paying for outstanding invoices, develop a positive relationship with the IT organization, etc. It must be a win-win for you and the client for this effort to be a success. Step 4 – Develop an action plan to address the issues and gain client agreement on the plan. Develop a specific action plan, or project, to positively address all issues. Be conservative in what you plan to commit to in terms of timing, cost, and specific deliverables. In other words, include plenty of buffer and position your organization to over-deliver. Communicate the plan to the client and gain agreement that the action items will positively address the issues identified. Step 5 – Execute the plan. Execute the plan and be sure to do a quality and timely job. Remember, this may be your second or third chance so success is critical this time. Step 6 – Over-communicate status of the plan. Communicate daily unless everyone agrees that less often is appropriate. When trying to turn a problem client situation around, you must over-communicate. When you complete the projects that positively address the client’s issues, you may ask the client to fulfill his part of the objective. This may be to pay an invoice, be more supportive of your support organization, or whatever the client agreed to do once the issues have been addressed as discussed in Step 3. CLICK HERE to download the tool and start converting unhappy clients to happy ones. 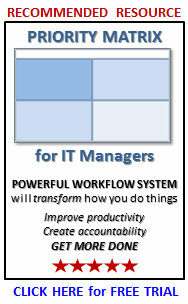 Your IT employees need encouragement and reinforcement in the good they are doing and what they are accomplishing. If their IT manager doesn’t make a point to do this, no one will know how much they are doing for your company. Let me tell you a story from my early years of managing IT. It was January and I was preparing to hold an Annual Kickoff Meeting for my IT organization. When I worked for IBM several years prior we always held an annual Kickoff Meeting to “energize the troops”, discuss the coming year’s strategies, and to give out a few awards. 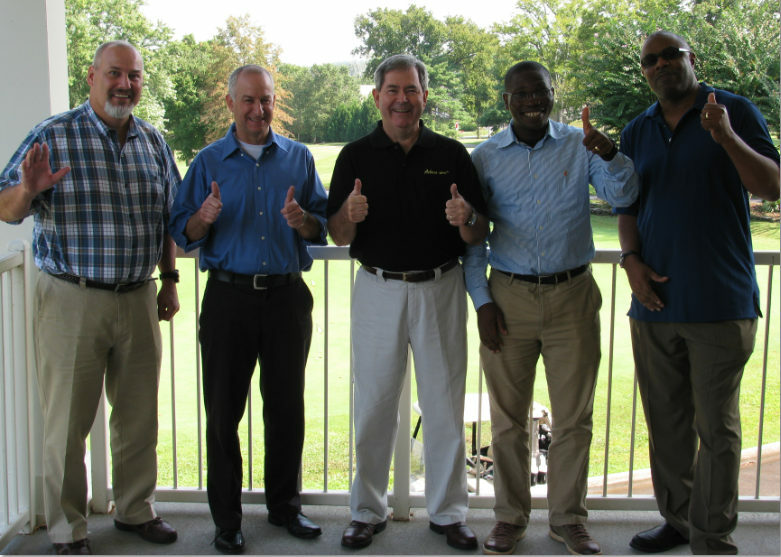 Our Jackson, Mississippi office combined with the Little Rock, Arkansas and Memphis, Tennessee offices to do this. It was great for building teamwork, getting everyone on the same page for the new year, , , and having some fun. At IBM in those days, we “worked hard and played hard”. I knew from experience holding an Annual Kickoff Meeting for my IT staff would be a positive motivator. I also knew I would need some things to help me make it a success. One of the key parts of a successful Kickoff Meeting is recognizing past year accomplishments. 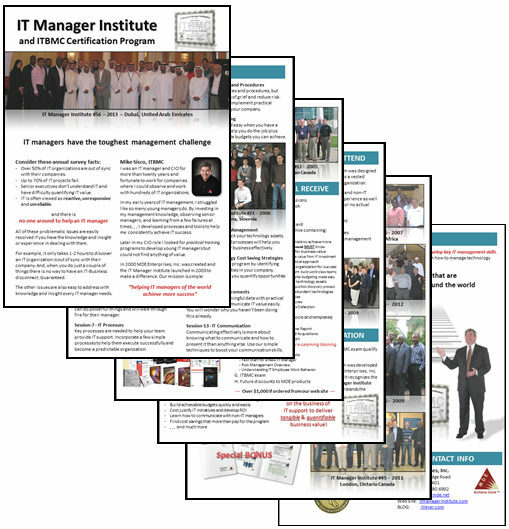 So, I began listing the accomplishments our IT organization achieved in the previous year. I went through monthly reports, looked at my calendar for the prior year, and even reviewed my Notes Log that I maintain in a journal/notebook. When I completed this exercise, I was shocked! We had achieved so much more than I realized we had, , , significantly more. I remembered most of the recent projects and accomplishments but had forgotten about many that had taken place six or more months ago. 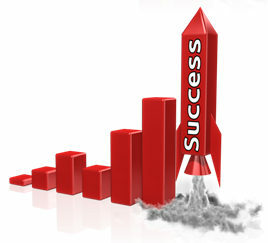 It is the manager’s job to help insure clients and staff know how much your team is getting accomplished. If you don’t make this a priority I can guarantee they won’t know and your IT organization will be “under-appreciated”. It was at this point I decided to track our accomplishments every year so I could keep our clients and staff “in the loop” about how much we get done and the value IT contributes to our company. A tool I developed tracks our IT achievements for the year. This report will help you remember key contributors to the success of your organization and which clients you help by project. The Key Benefits column is great to track the value your IT organization contributes. Update this report at the end of each month with that month’s achievements and at year-end you will have what you need with zero effort to collect it. Your employees need recognition, and this simple template will help you collect some of the best recognition material available to you – their achievements. One last thing, , , the report will help you track IT achievements, but it won’t do you any good unless you make a commitment to communicate the content with clients and IT employees, , , and don’t forget your senior management team. Managers and employees of your company need to know what IT is accomplishing. Share the information and watch the appreciation level for your IT organization go up. 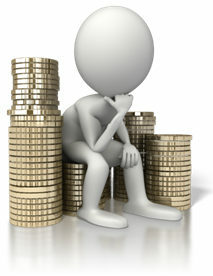 Let’s face it, , , budgeting can be a real pain! I’ve seen other IT managers spend hours upon hours developing what they think is a concise budget. Then they are so proud when they deliver it to their manager because they think it is “accurate” and “what their manager wants”. They would be wrong on all fronts. In many cases, these managers who spend hours to develop their budget are asking for more money four or five months into the year because their actual expenses are blowing out of their budget. Budgeting does not have to be an ordeal. It can actually be simple and a rather quick process when you are prepared, know what to do, and you have tools to help. Surprises happen and they almost always have higher cost implications. I developed a set of templates to help me budget. 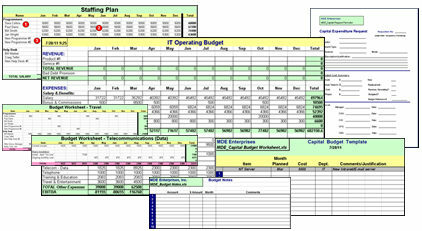 CLICK HERE to download the free IT budgeting templates shown above. I’ve developed dozens of budgets with these simple spreadsheets and I don’t recall ever missing my plan. The reason is behind the scenes in knowing how to budget and where to include buffer so you can weather the storms called “budget surprises”. A short article won’t do justice to develop your budgeting skills so I’m giving readers of this article a special offer – 70% discount off my book, IT Budgeting: operational and capital budgeting made easy plus links to a few of my ITLever BLOG articles that will help simplify your budgeting efforts. This 2nd edition e-book is practical and to the point, , , it is a quick read and an excellent tutorial for managers budgeting for the first time as well as those who have developed many budgets in their career. To learn more about the templates, order the IT Budgeting e-book with complete budgeting process, insights and tips on how to budget for an IT organization – only $9.00. CLICK HERE to order and receive the e-book and tools for only $9.00, a $20.00 discount. Last week I held a 2-day class on IT Due Diligence and Assimilation based on the process and tools I developed from managing the IT focus in over 40 company acquisitions. When I joined a small company many years ago to manage the IT Department, I had never heard of the term “due diligence”. I was about to get a heavy dose of it as we grew this $30 million company in 5 1/2 years to over $650 million in revenue by acquiring over 35 companies. We were an “acquisition machine”! Since I had no process or tools to conduct an IT due diligence, I had to develop them along the way, , , not so much a conscious decision but more by necessity simply to get the job done. In retrospect, without the tools and process I developed my company would have “run flat over me” as we generated tremendous change by acquiring so many companies so quickly. These resources “saved my bacon”. I have two more classes coming up this year in Dubai, UAE to deliver content on IT due diligence and assimilation. Oct. 20, 2013 — 1-day IT Due Diligence and Assimilation Overview session preceding a 4-day IT Manager Institute. The 1-day class is being provided to accommodate a few who want the material but can’t afford to return to Dubai for the class we have scheduled in November (see below). Can’t attend the class? 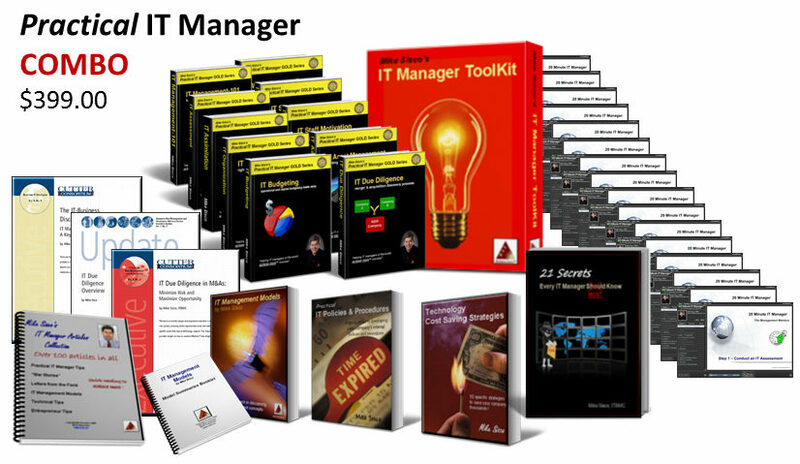 CLICK HERE to check out our IT Due Diligence and Assimilation BUNDLE of digital training and products, , , this is the most comprehensive set of IT due diligence materials in the industry. 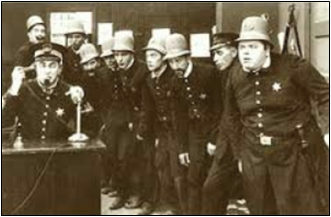 Are Your Escalation Procedures Better Than the Keystone Cops? How would you describe your IT Support Organization when a critical problem occurs – like with a mission critical business application or server? Better yet, how would your clients (non-IT managers and employees of your company) describe your support organization when a major mishap occurs? Would they say your organization is highly organized, knows exactly what to do, and takes care of the problem proactively and efficiently? Or, would they say your organization looks a bit like the “Keystone Cops”? You may be a bit young to know who the Keystone Cops were. In essence, it was a very early silent film cartoon series of a group of incompetent policemen who scurried around like “chickens with their heads cut off” trying to chase the bad guys. They did virtually everything but capture the crooks, ultimately succeeding almost by accident than by efficiency. Charlie Chaplin did a cameo appearance as a Keystone Cop in 1914. To respond to catastrophes efficiently and in an organized way, you need an escalation procedure that takes your team step by step to identify, diagnose and troubleshoot the problem. It’s about preparing for “what might happen” and organizing your support to take care of it in the event it actually does happen. When thinking about escalation procedures, the first thing you want to do is identify the potential situations where you might need an escalation procedure. There are dozens if not hundreds so what I like to do is to target key support areas and make one of my staff the “expert”. Let’s use e-mail as an example. 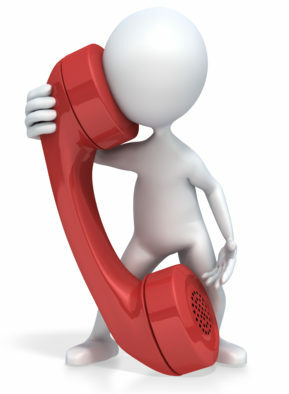 The staff member who is assigned to be our “e-mail expert” has three key responsibilities in regards to e-mail support. 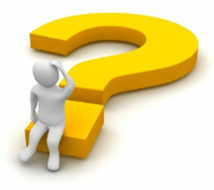 He or she is the knowledge expert on the topic of e-mail, , , the “go to person” for e-mail support. I don’t expect this employee to know everything there is to know about e-mail, but I do expect the expert to know where to go to get answers to issues and to develop outside resources to help in times of need. Being my e-mail expert means “you own e-mail”. My expert needs to help us develop more experts. We will identify 2 or 3 more people to become e-mail experts so we have backup and depth. Our primary expert will develop with me a curriculum to target appropriate training to develop our expert candidates and will be responsible for making it happen. I want my expert to develop escalation procedures for his “expert area”, , , in this case, e-mail. I’ll ask the expert to identify things that can go wrong with e-mail and we will target the situations that we think need escalation procedures. Then, we will ask the expert to draft the escalation procedures so we can fine tune them as a support team before putting them into place. When you target mission critical support issues, assign specific staff to be the expert for each area, and expect them to take care of the three responsibilities listed above. It will help you support your business better. One recommendation is to take the escalation procedures developed by each of your experts and put them into an Escalation Manual. Share this documentation with your IT support team and maintain a copy at the Help Desk so they can initiate the escalation steps as soon as a critical problem occurs. Be sure to train key staff on the procedures so they fully understand what to do when problems occur. Escalation procedures do not need to be complex. Keep them simple and to the point so they are easy to follow. Download the Escalation Procedure template I use and take a look at the sample escalation procedure for “Loss of Connectivity” where we define the steps to take when a remote office drops a telecommunications circuit and loses connectivity with our Data Center servers. I remember joining a new company as a new CIO early in my career. It was a small company and my first CIO position. I discovered quickly I had a lot to learn. One day soon after my start we experienced a problem with one of our key business applications and needed vendor support to resolve the problem. When we began looking for “who to call” and a phone number, none of the staff seemed to be able to find the information. The application was a mission critical application meaning much of our company employees depended upon it to do their jobs and to support our business. It had client service ramifications as well as cash flow implications. Well, you can guess that we started feeling the pressure pretty quickly because the system was down and we needed to escalate vendor support, , , yet we didn’t seem to know who to call or have their phone number. The good news is that we finally discovered what we needed, , , I think by reviewing a contract to get a phone number. Once the vendor got involved we were able to resolve the problem fairly quickly. From that moment, I decided to never let something like this happen to me again. Nothing bothers me more than to be in a situation where we need help and don’t know who to call. When you have a problem is not the time you want to go scurrying around to find your vendor’s contact information. When you join a new company or assume additional responsibilities, make it a priority to quantify your mission critical systems (hardware and software) and list the vendor information you might need to escalate support. Use a simple Vendor Support Contact List to identify your key vendors and the contact information you will most likely need at some point. Download the sample version I use and modify it for your specific needs. Give this list to other managers and to your Help Desk. CLICK HERE to download the Vendor Contacts template. Something else you should do, , , take your mission critical vendors to lunch or have them take you to lunch. You need to get to know them and you want them to know you. If you do need to escalate a support call to them, it helps when they know who you are and they will tend to respond better for you.